Tata Motors plans to move away from its image of a diesel car maker to one of a fuel agnostic car maker with emphasis on both petrol and diesel engines. The upcoming 1.2 liter REVOTRON turbo petrol engine will be at the forefront of Tata Motors’ strategy shift. This engine was revealed in the run up to the 2014 Indian Auto Expo and will make its debut on the Zest compact sedan, which is weeks away from being launched here. 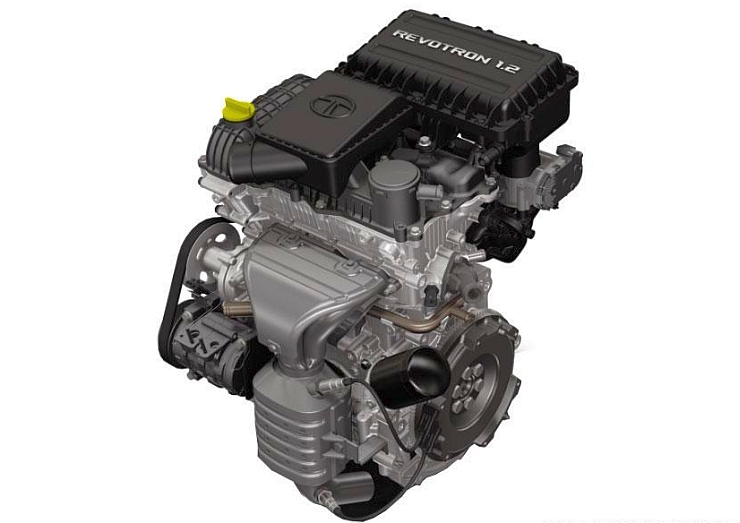 The 1.2 liter REVOTRON turbo petrol engine is a 4 cylinder motor that uses the cast iron block of the 1.2 liter petrol motor found on the Indica XETA. However, differences start from there and the REVOTRON motor gets numerous changes, with the biggest one being the addition of a turbocharger. Tata Motors has tuned this engine for driveability and good fuel efficiency rather than all-out performance. This explains the old-school 2 valves/cylinder, single overhead camshaft head layout. The result – An 84 Bhp peak power output at 5,000 rpm and a 140 Nm peak torque output between 1,750 and 3,500 rpm. Another reason for mating old school engine tech with turbocharging is to maintain a tight leash on development and manufacturing costs, one that will allow for sharp pricing. The REVOTRON turbo petrol engine will reduce Tata Motors’ dependence on Fiat for petrol engines and this self sufficiency will be apparent on the upcoming Zest compact sedan and the Bolt hatchback. Both cars will also get turbo diesel engines. The 1.3 liter Multijet turbo diesel engines will continue to be sourced from Fiat. Another reason for Tata Motors’ strategic shift towards turbo petrol engines has to do with the deregulation of diesel. By the end of this year, diesel prices will be completely deregulate and is expected to hit the 62-63 rupees/liter mark. The difference in prices between petrol and diesel fuels will hit 12 rupees levels, which makes fuel efficient petrol cars better buys for buyers who drive for limited monthly distances, of say about 800 kilometers. Tata Motors wants to be ready to take advantage of the shift in buyer preference back to petrol powered cars. The REVOTRON range of turbo petrol engines will be the key to that shift.